Rational Pastime: If the Season Ended Yesterday, 9/24: Tribe Heavy Favorites? If the Season Ended Yesterday, 9/24: Tribe Heavy Favorites? If the season ended yesterday, Sunday, September 24, the Cleveland Indians would be 3:1 favorites to win the 2017 World Series, the Los Angeles Dodgers would be the favorites to win the National League Pennant and the New York Yankees and Arizona Diamondbacks would be the favorite wild cards to move on to face those other favorites in the League Division Series. Former favorites, the Houston Astros would enter October play as the AL's two-seed and likely knock off the Boston Red Sox on their way to facing Cleveland. The Washington Nationals would be lightly favored over the defending World Series champion Chicago Cubs. The most likely discrete World Series outcome would be an Indians win over the Dodgers in five games. At the moment, the only squad headed to the postseason as a below-average team according to RPScore is the Colorado Rockies, which my model estimates to be a true .491 team. The Twins could survive a bad stretch in the final week of the season and still make it, joining the Rockies as a below-par playoff team. 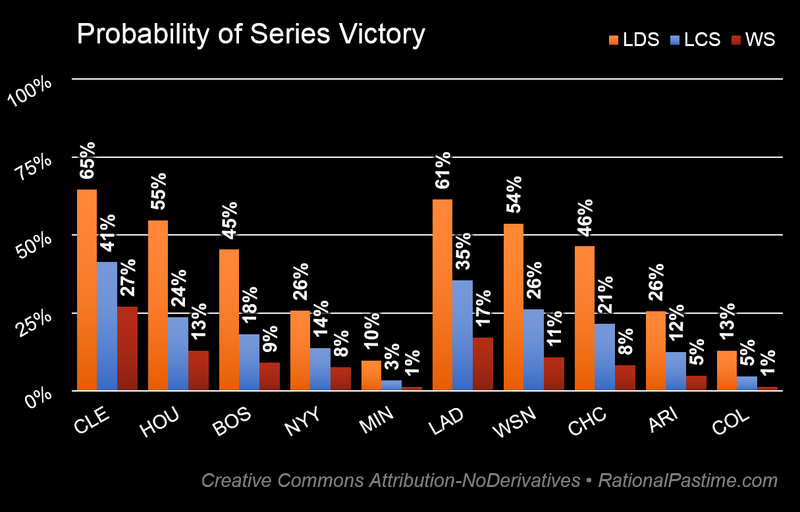 But baseball is finicky, and neither wild card favorite would be likely to have better than a 65% chance of advancing. For the first time all season, no team that's currently out of a playoff spot projects within the margin-of-error (currently 1.6 games) to reach the postseason. We have a new team at the bottom of the barrel: the Detroit Tigers have plummeted to 30th in my team rankings despite being a middle-of-the-road team most of the season. The Yankees will almost certainly end up a wild card team but I wouldn't want to face them if I were any other postseason contender: the Bombers rank #2 in RPScore, #3 in PythagenPat and, as Travis Sawchik notes, have under-performed their BaseRuns-adjusted record by about 9 wins..
Detroit projects to tie the San Francisco Giants for the worst record at 64-98 with the Philadelphia Phillies finishing 65-97. Just a month ago I projected the Dodgers would win 114 games with a decent shot of setting the all-time record with 117. They will finish with somewhere between 101 and 104. Ho hum. The home team (a numerator that includes Houston's relocated games in St. Petersburg and Tampa Bay's relocated games in Flushing) has won 53.7% of its games this year with a run differential of +457. Granted a three week absence I've accumulated a great list of fascinating baseball writing over that time. Each of these links deserve your attention (though perhaps not all at once). Travis Sawchik's idea for improving the Wild Card round is the best I've read yet. Three things I care about deeply are gender politics, modern political theory and baseball. Mary Craig nails all three in her investigation of the first women's baseball games at Vassar College. Reminder from Kyle Sammin: the R in WAR means replacement player, not average player. Therefore WAR (wins above replacement) is a measure of how many wins a player produces versus a typical minor-league call-up or a AAAA free agent, not the average player in baseball (who produces about 1-2 WAR). Put another way, a team full of replacement-level players would win about 48 games, not 81. More evidence from Rob Arthur that the construction of the ball is responsible for the surge in dingers. Mike Trout doesn't have a playoff win. To clarify, he isn't just lacking a series win, but even a single winning game in the postseason. Craig Edwards correctly notes that this is weird. Hey, Yankees: get your sh*t together, listen to Maury Brown and extend the netting before a child or an adult is killed by a flying object. I've sat behind the net before at both Yankees Stadium II and III (thankfully on someone else's dime), at old RFK Stadium and at countless MiLB parks. You don't notice it after more than two minutes. It's not a nuisance, it's just common sense. Get it done now. Why do we love admitted juicer Bartolo Colon, forgive admitted juicer Jason Giambi and yet continue to shun the likes of Rafael Palmeiro? Patrick Dubuque has a theory. Michael Hattery takes a look at how the Indians front office utilizes advanced stats. While nobody was looking but Jeff Sullivan, Jacoby Ellsbury set a new all-time, single season mark by reaching first base on catcher's interference 30 times in 2017. While this isn't strictly about baseball, Puerto Rico has produced some of the greatest baseball players of all time. That American island is now in a state of crisis thanks to continued neglect from the mainland and one of the most powerful Atlantic hurricanes on record. Please give what you can to help.